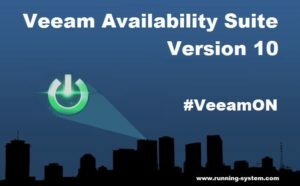 At their flagship conference #VeeamON with about 3000 attendees, Veeam Software announced new features for the next Version 10 of the Veeam Availability Suite. The new version should be available within the fourth quarter of 2017. One new feature is the support for physical computers backup (Windows and Linux) with fully integrated agents. This reduces complexity, as job management and automated agent deployment is now managed through the Veeam Backup & Replication console. A major innovation is Veeam CDP (Continous Data Protection). Leveraging VMware’s vSphere API for IO Filtering (VAIO), Veeam can reduce the RPO (recovery point objective = maximum acceptable data loss) down to a few seconds. A particular advantage of this feature is, that there is no need to create snapshots. Veeam taps directly into the VM’s I/O stream! Another long awaited and often demanded feature is the support for SMB and NFS shares. In the keynote, Veeam stated that version 10 will support scalable SMB/NFS backups and short-term and long-term file retention policies. Archiving old backup files to (hopefully) cheaper storage is possible with the new scale-out backup repository Archive Tier. This technology enables the customer to free up the primary repository and brings the data to targets like on-prem archive extends and the cloud (eg. Amazon S3, Amazon Glacier and Microsoft Azure blob storage). With announcing the Universal Storage Integration API, any storage vendor can now build storage integrations with Veeam Backup & Replication. The API allows Veeam to control the storage array (eg. creating or removing storage snapshots,…). Something that is only available for selected partners by today. Besides all the enhancements above, additional features are improving the existing version. Worth to mention is, for example, the Oracle RMAN integration that allows users to seamlessly stream RMAN backups into Veeam repositories. In the next month more information will be available about the new features of version 10 – so stay tuned. Interested in more articles about #VeeamON 2017 in New Orleans?